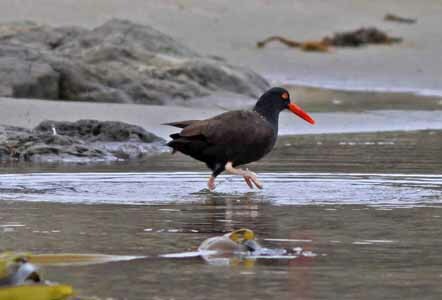 One of four year-round shorebirds, the Black Oystercatcher Haematopus bachmani, spends its entire life cycle along the rocky intertidal zone of the Pacific Ocean where it feeds on mollusks. It can be seen alone, in pairs, or in large groups. Most of all, its piercing call can be heard over the heaviest of surf. From May to September, monogamous pairs defend nesting territory above the high tide line along the headlands and sea stacks. The oystercatcher is considered vulnerable to decline due to its small global population size (10,000-12,000), low reproductive success and complete dependence on rocky intertidal shorelines. Oystercatchers are associated with healthy, productive marine intertidal habitat, which prescribes them as an indicator species of intertidal marine health. The long term goal of the Black Oystercatcher Conservation Project is to apply additional knowledge to current conservation efforts that will preclude the need for an Environmental Species Act listing. In 2009, the SU.S. Fish and Wildlife Service (USFWS) listed the oystercatcher as a "species of focal concern." In response to these considerations and lack of historical information, Audubon California undertook the first targeted survey in 2011 measuring distribution, abundance, and reproductive success in a subset of suitable intertidal habitats in California. 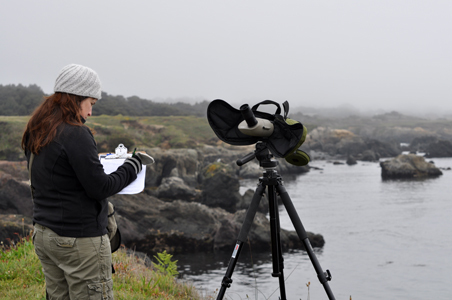 The Mendocino Coast Audubon Society organized a group of volunteers to help with the population survey along the Mendocino County coastline. Once thought to number around 1000 in California, final results accepted by the Journal of Marine Ornithology in February of 2014 suggest upwards of 5000 oystercatchers. The nest success study began on a small scale, covering only a few areas of established high density. The goal is to establish initial data on habitat status and fledgling success trends for at least five years. Over the past three years, studies have been conducted in fifteen California coastal counties. 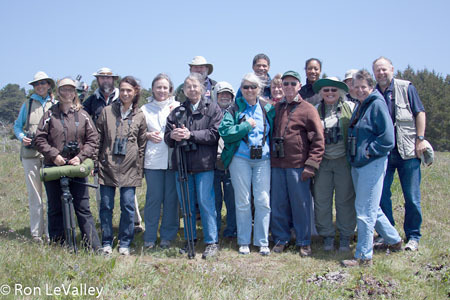 The Mendocino Coast Audubon Society currently receives a Chapter Grant from Audubon California to coordinate and advise volunteers and agency collaborators on guidelines, protocol, and data collection. Weekly surveys, May to September, are performed at select sites of high species density. A public outreach campaign was initiated by our chapter in 2013 through a Challenge Grant from the Bureau of Land Management's California Coastal National Monument Program. Visit www.facebook.com/MendocinoCoastAudubon for more information on our "Rock Star Bird." This project is an ongoing collaborative effort between California Audubon, Mendocino Coast Audubon Society, California State Parks, Bureau of Land Management and Resources Legacy Fund Foundation's (RLFF) Oceans, Coasts, and Fisheries Program. Audubon California's site for the science and conservation of Black Oystercatchers.